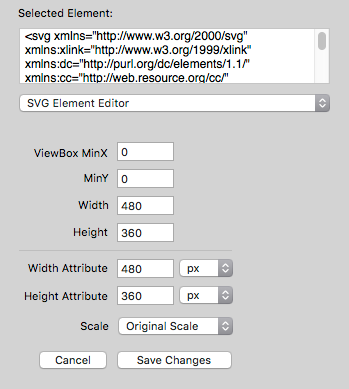 The <svg> Element Editor is used for editing the <svg> element. The root element of an SVG document should always be an <svg> element, but additional <svg> elements may be contained in the SVG document too. This editor contains controls for setting the “viewBox” attribute, and the “width” and “height” attributes. After changing the attribute values in the text fields, click the “Save Changes” to update the attribute values in the selected <svg> element. The “Scale” pop-up menu changes the width and height attributes to scale the document size relative to the viewBox. The scale options are: Original Scale, 12.5%, 25%, 50%, 100%, 200%, 400% and 800%.